Until recently, “smart intelligent buildings” and “smart homes” have remained two siloed segments within the larger buildings and facilities market; two very different application and usage environments at polar opposite ends of the market. Each of these markets tends to have distinct and different players, utilize different technologies, have very different buying behaviors and demonstrate divergent usage conventions. One would never characterize either of these markets or the technologies that inform them as having any real relationship, synergies and potential for cross-market leverage. 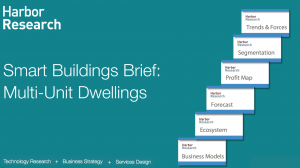 We believe this may be changing and the context for this convergence – or the “staging area” for new building and facility innovation — will be the apartment building, condo community or any other multi-unit dwelling. Why is this? Widespread and successful adoption of smart home or smart building solutions has been hampered by a lack in alignment of customer needs with technical capabilities amongst the many applications in the buildings market. Differing systems have been difficult to integrate for new combined values; most systems have only really enabled “alerts and alarms” and have not provided the high value-added services we have all been waiting for. Combine these hurdles with the historically abominable user experiences most of these technologies have offered and it’s no wonder adoption and innovation have not progressed very far. Trying to coordinate and leverage the application of similar technologies in vastly different applications and markets often creates contention. 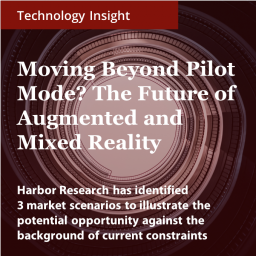 However, many of the participants we’ve spoken with in the rapidly evolving multi-dwelling market are coming to see the continuously evolving relationship between these two markets as fertile ground for innovation. They believe that the core technologies from both markets need to be interwoven and mutually supportive across diverse applications, facilities, services and users. In fact, many market participants believe success in either arena will increasingly go to the players that effectively utilize the combined innovations from both markets. Many of the technologies and services that would serve millennials in homes, for example, are the same and could be leveraged in a similar manner to serve the needs of professionals in office and commercial environments; user driven involvement and collaboration should drive many of these technologies across traditional market boundaries. The same core technologies that are being leveraged in large commercial buildings and facilities to improve energy usage and bring down operations costs can be more readily applied now in apartments and other multi-unit dwellings. In both markets, data and analytics technologies are at a cost point and state of application readiness to reveal many dimensions and nuances about usage patterns and needs; data will inform many new services for individuals whether they are consumers at home or professionals in offices. User needs and experience will be the fundamental organizing principle – whether the needs are centered on comfort and convenience or safety, security and peace of mind, the convergence of these two worlds may now just be beginning to take shape and become the catalyst for a whole new wave of facility automation, intelligence and smart services. Building occupants grappled with whom to call when their work area is too cold or how to gain access to a facility when they forget their access card at home. Honeywell’s new Vector Occupant App addresses these common frustrations, combining the convenience of today’s mobile devices with connected building features to give users more control over their comfort levels and ability to securely move about the workplace. 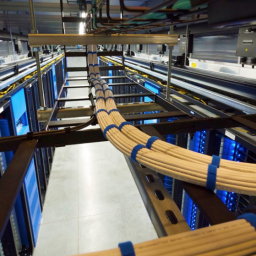 Johnson Controls joined the Cisco® Digital Ceiling community, which provides a platform to deliver better building performance to managers and user experiences to occupants. By enabling the convergence of the IT network and building technologies, including HVAC, lighting and security, this framework offers building managers a means of applying the benefits of IoT throughout the facility to improve the productivity, comfort and safety of occupants. Announcement of Belkin’s WeMo line of smart home products to work with Google’s Home, which provides access to the voice-activated, artificially intelligent Google Assistant, is a critical early step to challenge Amazon’s smart home presence. This is particularly important in the context of Google’s expansion of the Weave protocol, which will soon enable integration with a variety of consumer focused and home automation offerings from Belkin, Honeywell, Wink, TP-Link, and First Alert as well as Next, SmartThings, Philips Hue and IFTTT. The speed with which Amazon and Google can expand the services that their smart assistants interface with, moving beyond infotainment and into safety, energy management, and building automation applications will likely determine future leadership of this market. Transparency and efficiency are driving demand for building management systems, assisting in managing the 80% of building lifetime expenses that come from operating costs. While building management platforms have traditionally been implemented in commercial buildings, trend towards applications in residential spaces seen in Siemen’s Total Room Automation offering, which combines room HVAC, lighting and sharing systems into single package. 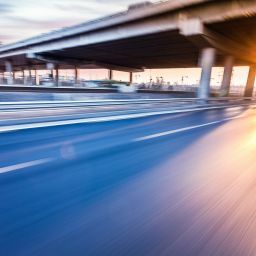 The firm’s partnership with IBM seeks to combine the Siemen’s domain knowledge with IBM’s analytical and database technologies to maximize the value of data from connected buildings. The “Connects with Control4” program includes nearly 10,000 supported third-party devices, with new partners Amazon, Lutron, Sonos, Z-Wave and more, driving the industry’s largest interoperable smart home ecosystem. The new OS 2.9 operating platform from the home automation provider provides new opportunities for MDU owners and occupants, providing building-wide video intercom communications and access management on top of customized smart home solutions for individual residences. Honeywell’s Lyric thermostats are already accessible through Apple’s Siri-centric HomeKit. Starting in 2017, the professionally monitored Lyrics Home Security and Control System will also work with the Apple platform. Neither Vivint nor ADT have enabled their professionally monitored security systems to be accessed via HomeKit, positioning the Honeywell line for success among iOS fans.